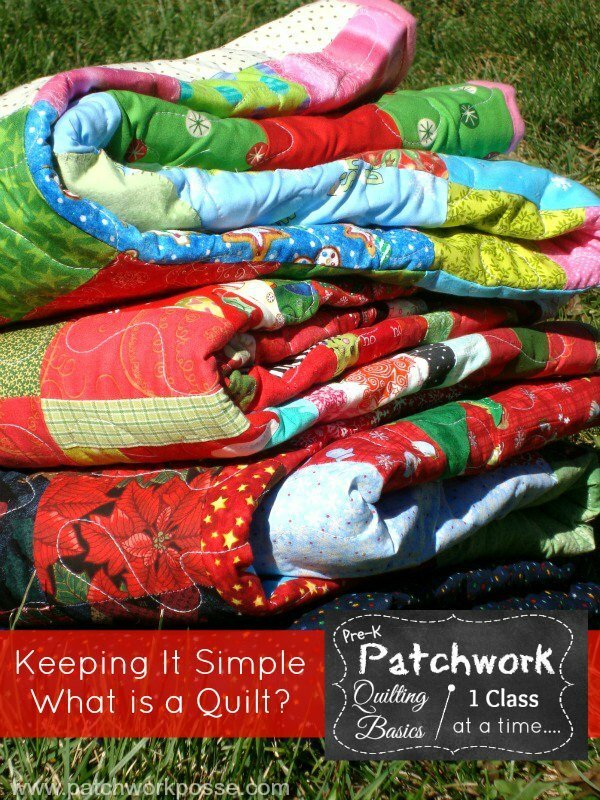 Keeping it Super Simple- What is a Quilt? So the big question we are going to start the series of Pre-K Patchwork is What is a quilt? The dictionary puts it this way? It can be either the word used for the process of making the quilt…or the finished product. The Quilt. We will go into further details in the next lessons on what we use for the layers. I have seen quilt makers use flannel for the center layer, I have used an old wool blanket. The layers can be anything that is able to be sewn together. The idea is to keep it cozy, but sometimes you just use what you have! This is the clear difference between a blanket and a quilt. Blanket being something in the singular form. A single piece of fabric. All by itself. It has not been joined to other layers. These can also be reversible- like fleece. The pattern is on both sides of the fabric, making there no ‘wrong’ side. Because of the layers of the quilt, you have more control over content too…and look….and how heavy it is…and how large it gets….etc. Your front can look very different from the back, or you can make it co ordintate, or plain, or it can show off your quilting, or be a whole new quilt in itself. I love being in charge of all of these decisions. This is one of the reasons I became a designer- I love the process of exploring new textures, weights, combinations, patterns, and then putting them all together for a finished product that gets wrapped around someone- to keep warm, or remind them of you. Q&A: What is a quilt to you? I’d love to hear your thoughts…. leave a comment and lets discuss! 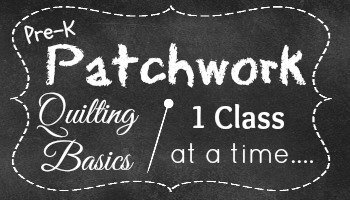 Don’t miss any of the pre-k patchwork- Quilting basics. Sign up to get email reminders when the new lesson is posted! Snuggley, warm it expresses the love that the person who made it shows for you the person who received it. That is a great way to describe it! It goes both ways too. I love the way that I can give something that will be enjoyed when they are the most comfortable and feel the most protected. I love those words to describe the quilt! Thanks Janet for sharing. I happened upon your site from a Pinterest pin, and I’m so excited! I’ve been curious about quilting for years now, but I’ve also been intimidated since I know nothing (nothing!) about quilting or sewing. I can’t wait to read about the basics of quilting. To answer your question, for me a quilt is a touchstone. My mom has quilts that my great grandmother made, and every time I touch one I have a solid reminder of the woman she was. It’s comforting to have that connection to the past. A quilt is an never ending circle of love – a gift for the future made in the present from memories of the past. Thank you for doing this. I want to make quilts for my grandchildren and maybe my great and great great grandchildren will use them. Memories of me and my love for them will be sparked by the quilts just like memories of my grandmother are sparked when I use the Afghan she made me. This is a great website! I’ve been wanting to get into quilting, but it’s hard to know how to start. Thank you for the step by step information. you are so welcome Amy- and welcome to quilting! Reminds me of my childhood with my grand parents, when I lived with them. Now I make my own for myself, make a few for others. the visionaries who find the fabrics; the piecers who plan, cut and assemble the design; the sewers who stitch, by machine or hand; the givers who share and the receivers who enjoy them. For me, it is also a connection to someone lost who indulged in this craft before I realized it existed. She was all of those things and I cherish the quilts, so much a part of herself, that now reside with me. I am now a quilter, because of her inspiration and in her honor.